Our motto might be, “If there’s a train station there, we’ll go. If it’s via a scenic route, we’ll go there twice just to take in all of the views from both sides of the train.” In the case of Clermont-Ferrand, a city in central France that’s been inhabited since prehistoric times, we didn’t even have to backtrack because we went up one set of tracks (la ligne des Causses/de l’Aubrac) and came home on another (la ligne des Cévennes), both of them colored green on the map to indicate journeys not to be missed. 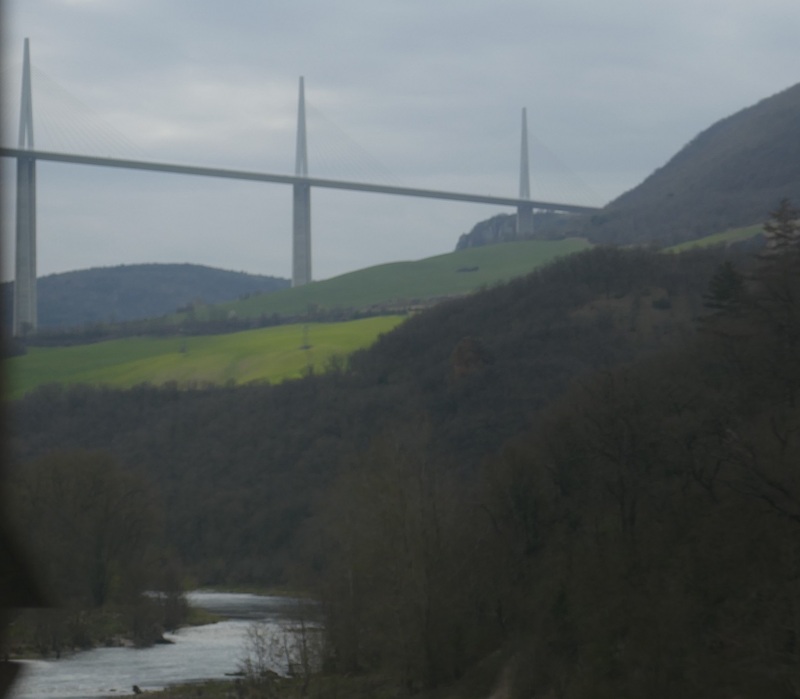 In store for us were tracks clinging to the cliff sides, wide gorges with rivers below, tunnels, castles, a viaduct built by Gustave Eiffel in 1885 and a dinner reservation that first evening at the most popular restaurant in town. 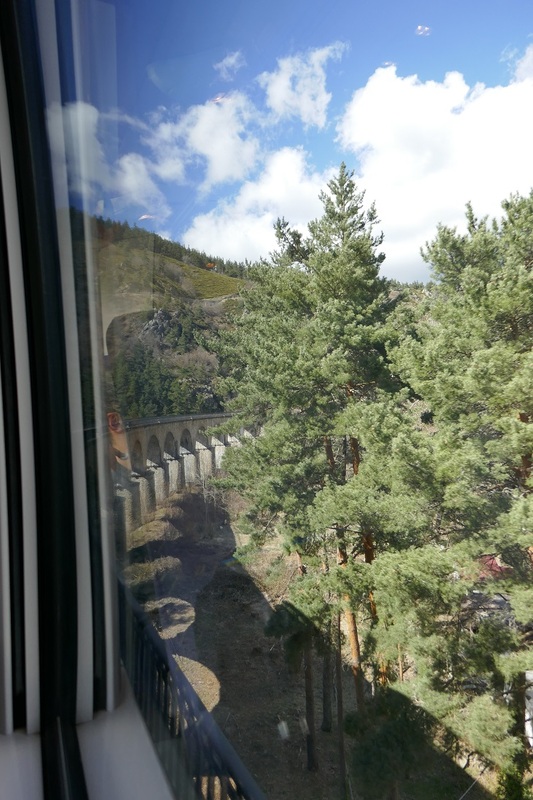 Before the direct trains between Paris and Barcelona were moved to the high-speed line, they traveled on this same single lane track that we took across the top of the Massif Central mountains. Ironically that 1000 km (620 miles) trip between these two major cities now takes a little under 6 ½ hours which matched the time we were spending on just a 300 km (186 miles) portion of the journey and we didn’t mind at all. Bill had packed a picnic lunch that included Roquefort cheese since we’d be passing through the area where it’s made then matured in limestone caves and we enjoyed it with a full-bodied red wine from our own region. Nibble the cheese, sip the wine, and take in the view. Once we got checked into the hotel, we still had some time before dinner so we wandered over to Place de Jaude, a huge open public square surrounded by department stores, cafés, and restaurants and decorated with fountains, monuments and in the summer, flower boxes. 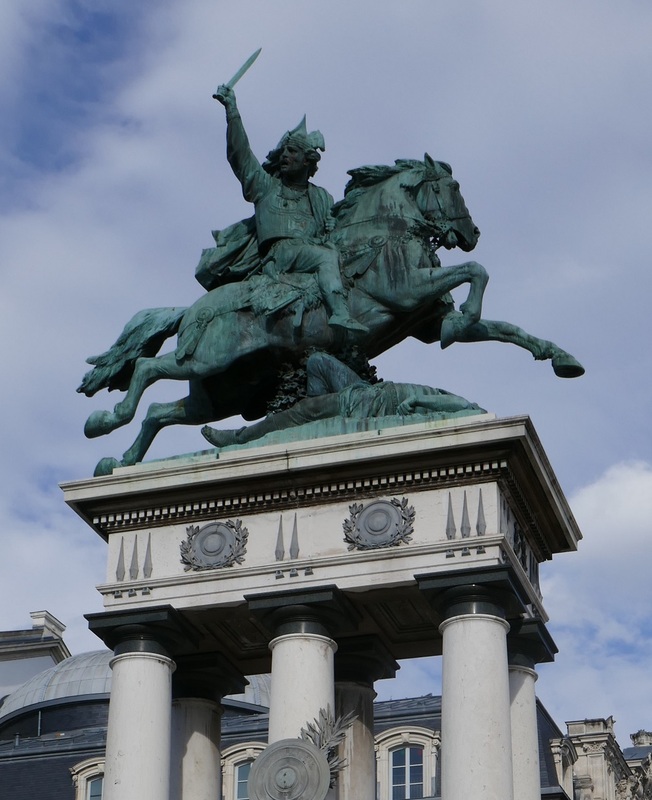 The statue that I wanted to see in particular was of Vercingetorix, a local hero who, in 52 BC successfully defended the city against Caesar’s army. The sculptor of this bronze work of art was Auguste Bartholdi who created the Statue of Liberty in New York. For longer stays we enjoy renting an apartment that allows us to shop in the local markets and prepare meals at home but for this visit of only 2 nights we opted for a hotel and restaurant meals. Avenue* Restaurant rightly describes themselves as “Market cuisine, fresh, colorful and tinged with a strong Mediterranean accent”. Fresh fish and seafood took prominent spots on the menu with more traditional items like foie gras and escargot not far behind. I’ll include their web address below along with the other 2 restaurants we enjoyed. 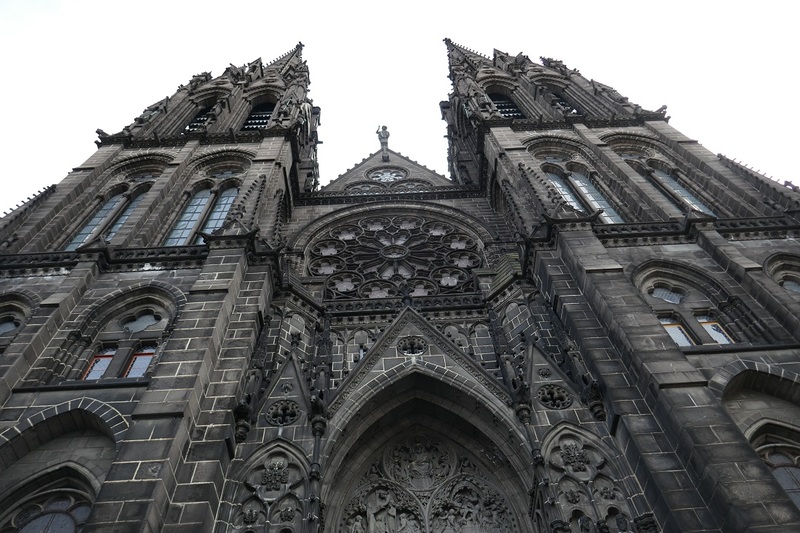 Clermont-Ferrand has a cathedral and a basilica, both with Notre-Dame as part of their names, with histories dating back into the Middle Ages. If you’re familiar with the cathedral in Cologne, Germany you’ll have a good idea of the style and the color of the one towering over us. 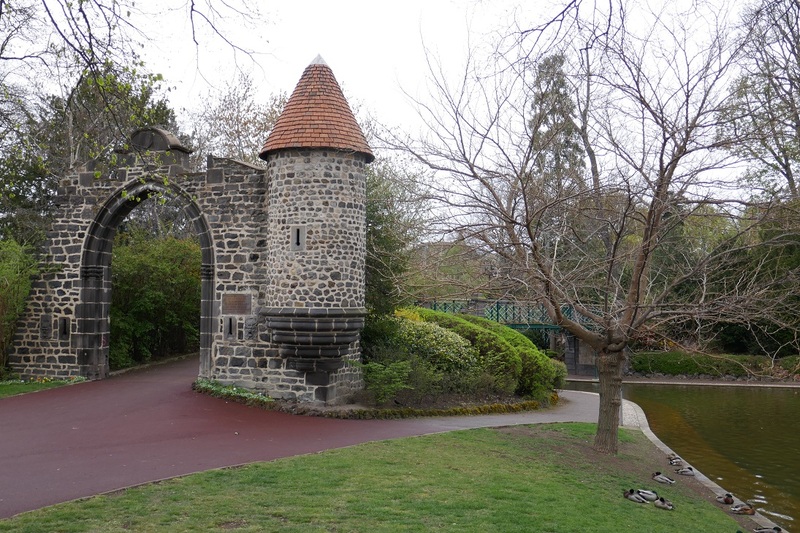 The black color of the stone did not come from centuries of coal smoke but from its being constructed from volcanic rocks. One page of the city’s tourism website calls it “City on a volcano” referring to all of the dormant (in French, so peacefully called “sleeping”) volcanoes in the area. We didn’t have time but it’s possible to visit one of those “sleeping giants” including taking a cog railway to the top of Puy de Dôme. 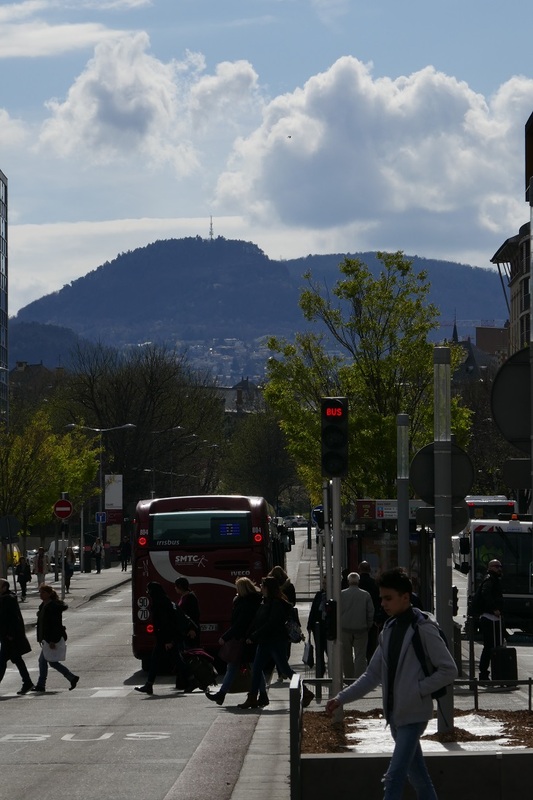 That same tourism site suggests two art museums: Musée d’Art Roger Quillot that covers the Middle Ages through modern art and Musée Bargoin for archaeology and textiles. 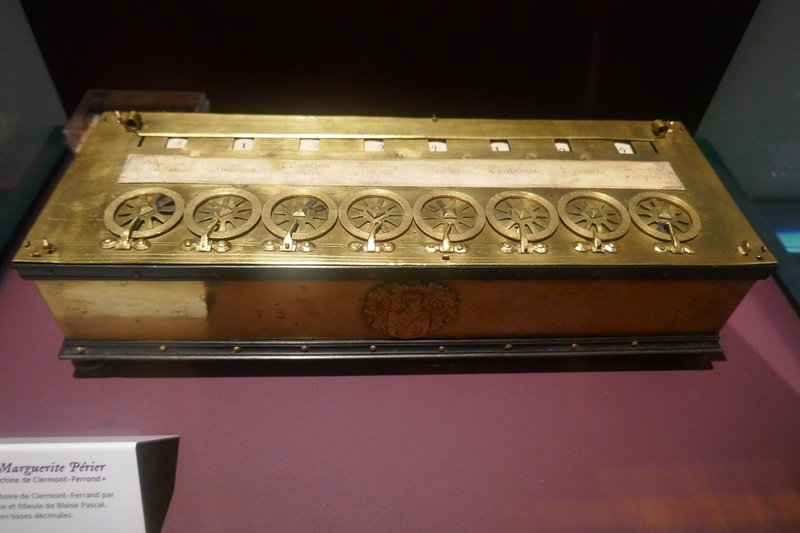 What caught my eye, however, was the natural history museum Henri-Lecoq that includes a calculating machine that mathematician and native-son Blaise Pascal invented in 1642. 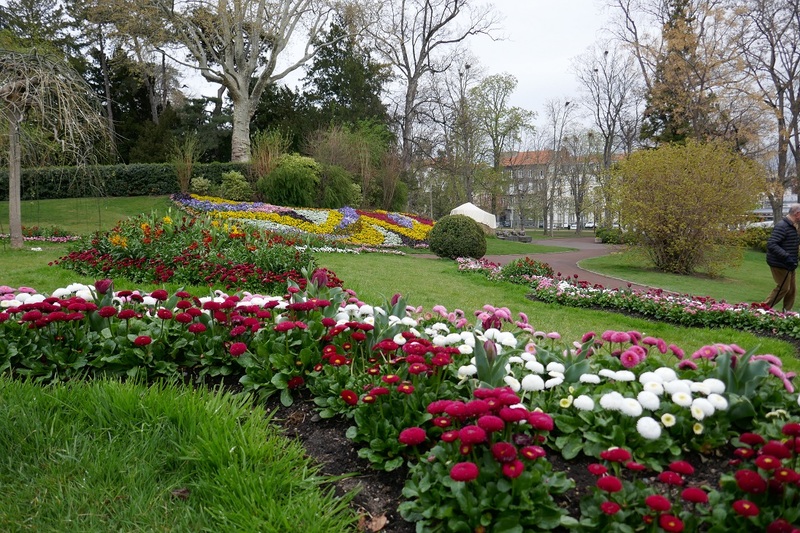 Just outside this former private mansion are its gardens covering 5 hectares (12 acres) in the middle of the city with trees, flowers, lawns, fountains, footpaths, and a pond. 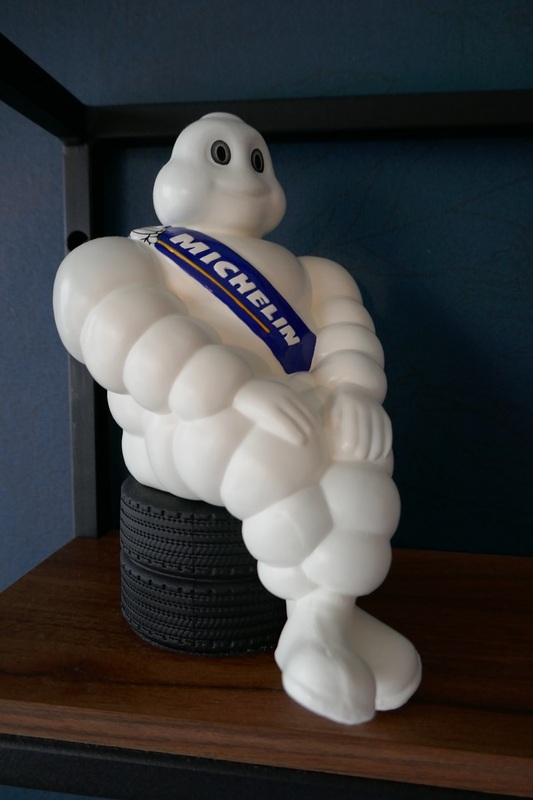 Michelin is headquartered here and they too have a museum, part of it interactive, that traces the development of the rubber tire. Historical objects include a biplane the company built for use in WWI, the world’s first automobile to participate in a race using tires, and a railcar from the 1930s with rubber wheels. Entrance is included if you buy the Claremont Pass that also gives you a choice of one of the other museums mentioned above, the train up the volcano, and more. I’ll put a link below. For our return home we hopped aboard a train with iron, rather than rubber, wheels to head back down towards the Mediterranean on a different scenic route than the one on which we arrived. We often had a highway as a companion on our journey northward but now we were in especially rugged terrain where no roads exist. In the 1870s, author Robert Louis Stevenson (Treasure Island, Dr. Jekyll/Mr. Hyde) explored this area by donkey but we were in much more comfort, again thanks to Bill’s picnic skills, as we passed through 106 tunnels and crossed 1300 bridges, many with great views of the valleys of the Cévennes national park below. 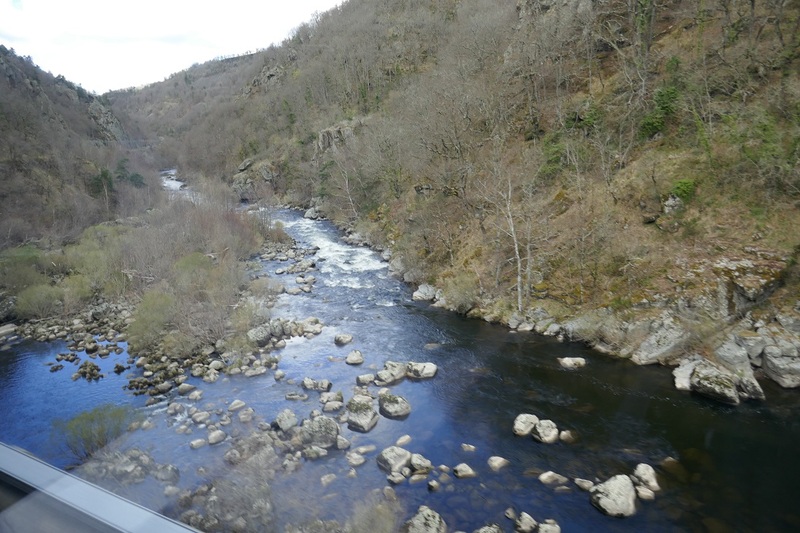 Travel notes: For the best views on the northbound trip we sat on the right side of the train. Going south we sat on the left. The schedule shows the journey from Béziers to Clermont-Ferrand as a direct train but we had to change in Neussargues. 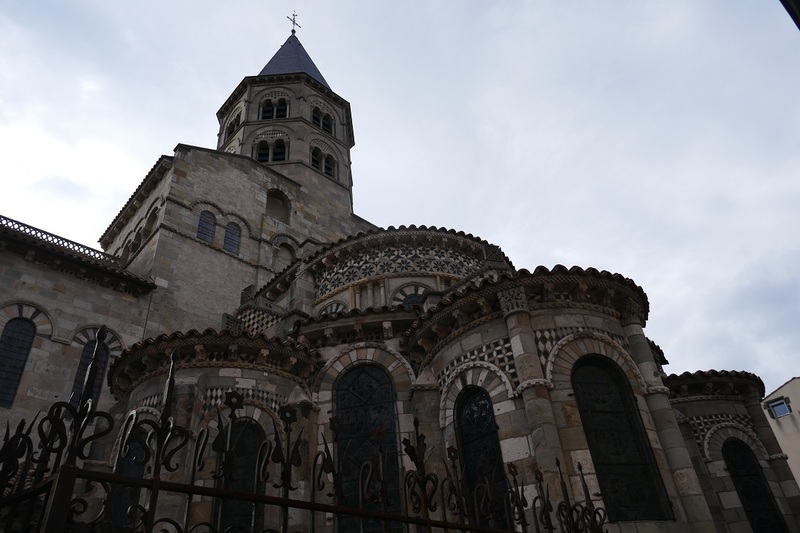 Posted on April 14, 2019, in Life in France, Travel in France & beyond and tagged Americans in Carcassonne, Public transportation, Restaurants. Bookmark the permalink. 1 Comment.